ALONG THE SHORE is Weiner’s third exhibition at the gallery. Three large wall works occupy the gallery space along with new works on paper. 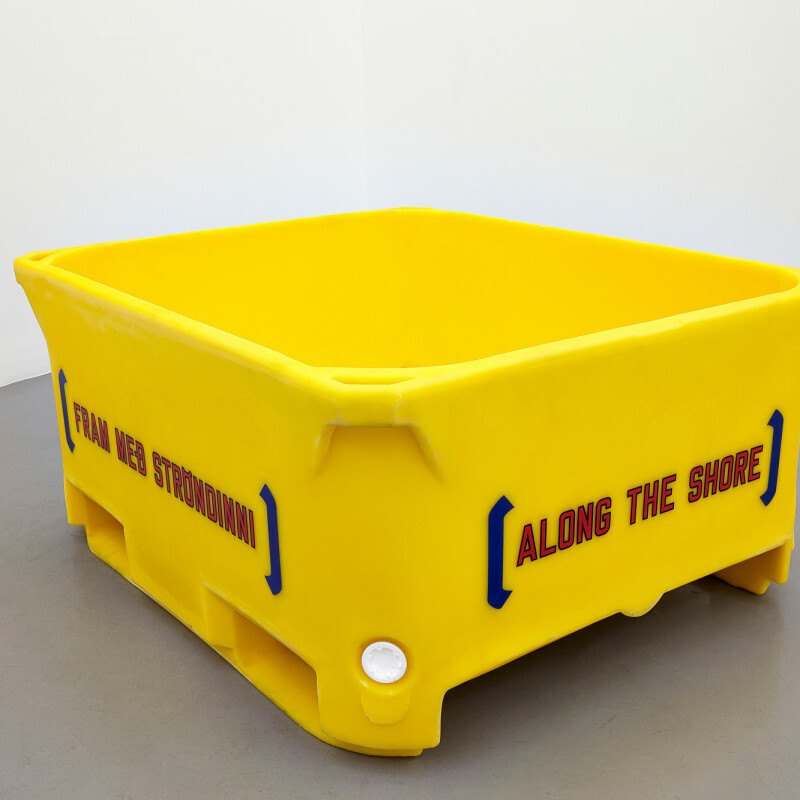 On this occasion Lawrence Weiner has made a mass-produced fish tub, used for commercial fishing around Iceland. Fifty such tubs will be distributed between fisheries and used in the coming years. Additionally, there are ten numbered and signed editions shown in the gallery. Lawrence Weiner has informed us that language is a sculptural material and that in his works we construct sculptures through our reading. In the gallery we are confronted by messages from the artist that can hardly be more straightforward, simple sentences placed on the white wall. The act of reading, on the other hand, is a more complex issue. It turns out that the words construct images rather than sculptures and we take on a voyage of the mind. Two languages collide, the lingua franca of our age and an eccentric and peripheral language that a nation of a few hundred thousand souls uses and preserves for the world. The finer gradations in each language may have an impact on the images we build, and no two viewers construct the same images in their mind’s eye. We draw landscapes or maps, place ourselves in our own memory or construct new worlds of hope for the future. The maps and the images may show us the right locations, the best fishing grounds or the most fertile valleys. The fish tubs that are stacked up in the gallery encourage us to take on a voyage without a given destination. One day they will disperse, and even though some of them may end up in art collections, others will travel the seas, go from harbour to harbour and will be filled with fish. In that way art will take part in the economy that some say is the only one Icelanders understand. It is simple enough: fish = money. The travels of the mass-produced fish tubs that the artist has transformed with his ideas broaden the horizon of the artwork. The scope of the work is reminiscent of the expansiveness of the ocean that we nonetheless want to divide, capture with our words and give names to: the Atlantic Ocean, the Indian Ocean, the Pacific Ocean, and so on. Again images come alive and we develop our ideas about distant oceans and shores. Without giving it much thought we have developed mental images about one ocean being different from another, even though we may never have laid eyes on them. It becomes clear that sometimes it is enough to know about locations on a map in order to envision them, and the same goes for Weiner’s works. It is enough to know about their existence to have a part in them. The works linger on in the mind after we have constructed them through our reading. Language, the essence of conceptual art and of the works of Lawrence Weiner, sets us free and holds us captive at the same time. Without language there is no art. Words are the basis of our world and we need them desperately. Without them we are adrift in a world without meaning.